I am finally back in Odense. The journey has been quite long, 11 hours in total. I traveled its first part (Lappeenranta → Helsinki) in Pendolino train. Actually, it was two Pendolino trains in one, but still it was not enough for all the people. I tried to buy a seat reservation, but the train was hopelessly full. Pendolino trains in Finland is better comparing to the Czech Republic. It is not only used as the eye candy, but as the fast mean of transport. On tracks between Lahti and Helsinki we went at speed of 220 km/h, that is something Czech railways can only dream of. Rest of the journey was more or less all right. At the Copenhagen airport I just ran into the first train I saw and than discovered that it is a right one . During the week holiday I traveled over 2100 km by trains and 1850 km by planes. I really liked it and I think it is not my last visit to Finland. 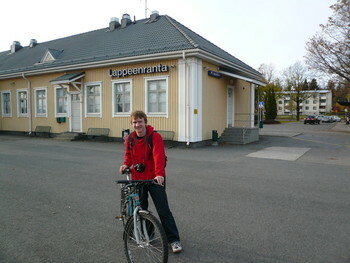 On Thursday I was just relaxing and did not want to travel anywhere, so I stayed in Lappeenranta. After we woke up, we decided to have only a little breakfast and take a walk along the lake to the university for lunch. The weather was not so good for taking marvellous pictures, but at least it was not raining. When we finished our lunch, Pavel stayed in school for some lectures or laboratories and I walked to the lake again to enjoy the nature. 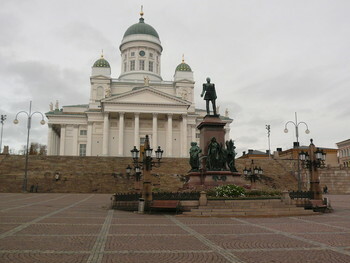 On that day I went to sleep relatively early, because I wanted to take a train to Helsinki at 8:35. As I sat down in the train, I fell asleep and woke up at the Helsinki main station. What a pleasant journey . In the city I walked a lot around the centre. I also visited the National museum and took the boat to the fortress of Suomenlinna. The last city I visited during my trip to Finland was Lahti. 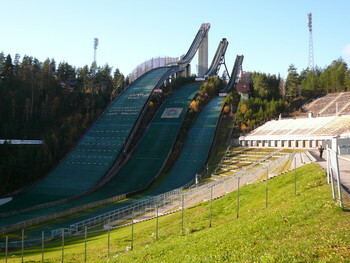 I traveled there because I was interested to see the ski jumps. Again, I walked slowly around the centre and went to see the harbour. I did also a little bit hiking in the hills near the ski jumps area. Just after noon, I took a InterCity train to Joensuu. After two and half hours long ride (and enjoying the view Finnish nature) I was finally there. I had three hours until my return train departure. The city centre is not so large, so I needed just two hours to walk everywhere, had lunch at „Mr. Bob coffee“ and do some shopping. It was a really nice trip, although spending 5 hours in a train was a little bit tiring. Today in the evening we had a little dinner with a dessert. I made some photos, so here they are. The holiday just began, so I decided to spend it by visiting my friend Pavel in Lappeenranta, Finland. On Monday morning, just before 6 o'clock, I left Réka's place (thank you again for keeping me there ) and began my journey. At the train station I encountered a small problem, the ticket machine rejected to accept my credit card. After a few tries I hardly find 20 kr in coins to buy at least a ticket for half of the way. When I was changing to the metro I bought the ticket for the other half. At the airport everything was all right, I was just tired. 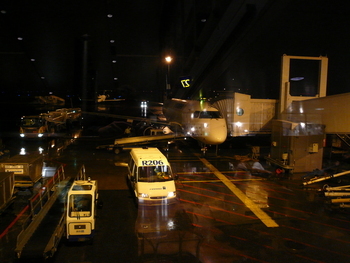 When I arrived to Helsinki airport, I went directly to the baggage claim. I was very lucky, because my baggage was among the first that came out of the conveyor belt. They didn't care so much about proper handling, so my suitcase looked like they tossed it out of the airplane just before landing. At least, it was not lost . My next stop was Tikkurila station, the closest station to the airport. I came to the ticket office and said that I would like to buy a InterRail ticket for Finland. She just looked me and said: „Noo, we don't sell it here, go to Helsinki.“ Ok, fine. 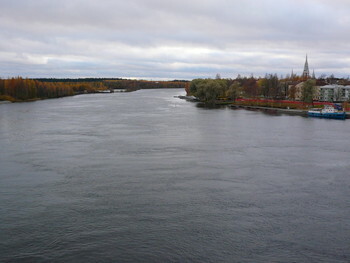 So I went to Helsinki and I knew that I need to be very quick, otherwise I would not catch the train to Lappeenranta. Fortunately I managed to buy it and catch the train with a large time reserve (between 4 and 5 minutes ). When I got off the train and met Pavel, I decided to take a bus instead the long walk. The problem with buses is, that they will not stop unless you push the stop button. But that is quite difficult if you do not know where exactly you should get off. 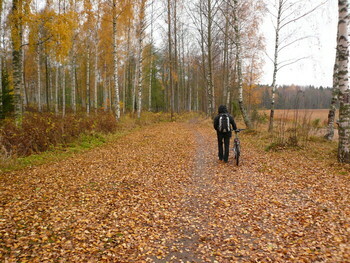 Pavel had a bicycle, so I needed to go alone. When the bus came, he explained everything to the driver and told him to notify me when my station is near. Just after Pavel left, the driver changed with another one. What a nice surprise! I tried to describe it to the new one more or less the same way as I had heard before. The driver said: „fine, I will tell you.“ But that never happened and when I asked how far it was, she just responded: „Oh, I forgot about you, but I am going back in a while and I will tell you for sure this time“. At least I had a great opportunity to do sightseeing and take a nice shortcut through the terminus station. On the way back I saw Pavel on the bike, he was waving at me. I interpreted it in a way that I should got off on the next station. Wrong again . Then I just stopped and did not move, I did not want to be lost more than I had been. When Pavel found me, we just laughed to my traveling luck while walking to the dormitory for another 15 minutes. Anyway, I came to Lappeenranta at the right time, because in the evening there was a „Swiss party“. 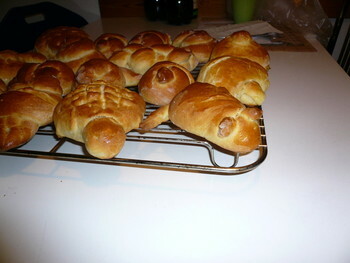 Bunch of Swiss people were making a lot of specialties. It took place in a cottage near the lake. There was many people to meet. The food was just delicious, the beer was drinkable. We even went to warm up to the sauna and then jump to the cold lake that had around 5 degrees. I really enjoyed the evening and I am looking forward what will happen in the rest of the week. Today I came to visit my friend Réka to Copenhagen. I came there in the afternoon and left all my thing at her place. After that we went to the city, I went by train, she went by bike, so I got a little time to walk through the city centre and do some shopping. 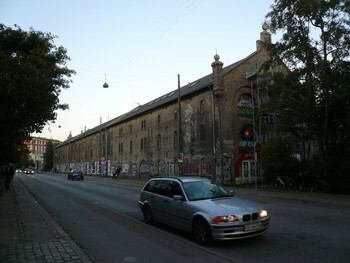 We met near the Christianshavn metro station and headed to the Christiania. We stayed in Christiania for a quite long time, because it is a big and nice place. Unfortunately it is forbidden to take photos there, that is why you cannot see any in the photo gallery. I could not enjoy night life in Copenhagen. I needed to go to sleep soon, because I had to be at the airport at 7 o'clock on the following day. I Wanna Be the Guy (or short title, IWBTG), is a classical platform game. The thing that makes it exceptional is its difficulty. I think it is the most difficult and challenging game I have ever played. It will certainly train your reflexes, movement coordination and the most, your patience. If you play it, there will be some situations when you will want to eat your keyboard or throw your computer out of the window, I can guarantee you that . The game is difficult, but also addictive. I think that if you can manage to go through the first two screens (if you go up in the beginning), you have the skill to continue. You can download the game for free on this site: http://kayin.pyoko.org/iwbtg/. Today I got things moving. Since I didn't receive anything in last three weeks, I went to the bank, again, to ask, what was going on. I have a bad luck, almost every time I go there, I talk to the same woman. When I explained my problem (in a polite way, of course), she disappeared and brought the financial advisor, so I entered another level of discussions . The people at the cash desks don't know anything about banking, they even don't know which products the bank offers and some of them seem disgusted with their work. But your only option is to deal with them and have strong nerves. But on the other hand, the financial advisor was exactly the type of person I am used to meet in banks. He said he was very sorry and that he didn't know what could happen, but he offered the solution of creating the new contract, that I would sign tomorrow. So I hope, from tomorrow everything will be all right. After the whole Friday spent inside Copenhagen I went to visit my friends to Roskilde. Since it was Friday and I was not there for some time, we needed to celebrate. During the party we finished the last supplies from home, as you can see in the photo gallery. 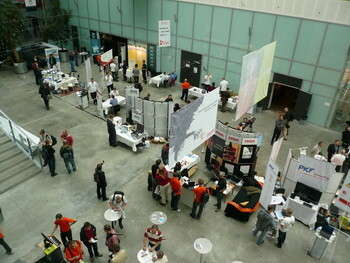 Most of the people went partying to the Roskilde city after 11 o'clock, but I stayed and went to sleep, because I needed to get up early and be able to listen to the lectures during the next day.